The Inner Belt, NW Xway and SW Xway would today be traffic clogged nightmares. Besides, cancelling them freed up funds to build the Orange Line in the SW corridor, and the Red Line to Alewife. Also, the Inner Belt and NW Xway would have made most of Cambridge into another Dallas TX. The City Hall Plaza proposal is okay, but doesn't go far enough, Tearing down the whole damn thing and redeveloping the entire GC area is what's needed. Wasn't the entire Braintree Line part of that funding, too? The Quincy branch opened in 1971, but the expressways were cancelled in 1972, so the Quincy extension would not have been funded from the cancelled expressways. The extension to Braintree came later, in 1980, long past the time the surplus funding form the expressways would have been available. there's a nice backdrop shot of Downtown, and you can see 1 Boston Pl u/c, topped out. Does anyone know why the Bulfinch area has so little trees? Usually when new developments go up they plant trees on the street, but on Haverhill st for example between 2 new developments there isnt a single tree on either sidewalk. For a road with no retail either it makes for a barren wasteland. When you walk around many other streets closeby as well theyre barren. What gives? The Seaport for example puts up trees at every new building... and pretty much everywhere else too but here. This is a street with new development on both sides so it should have been automatic... it leads to a bigger issue at hand though. In a socialist leaning utopia like Boston, you're going to get an uneven distribution of political hotcakes & real syrup. They put up trees in the Seaport because there are nimby's to placate. They are slower to put up trees on our older, built out blocks because it's not an area deemed in urgent need of peasantry disarmament/pc enforcement. in a few years, we'll see lots of trees at Central Wharf. Has anyone posted about City Hall becoming more responsive to tree requests? 1. stop (someone) from being angry or discontented; placate; pacify. "concessions were made to conciliate the peasantry"
2. gain (esteem or goodwill). "the arts which conciliate popularity"
Last edited by odurandina; 03-02-2019 at 04:20 PM. Yea adding them to existing blocks isnt a priority but Haverhill st is flanked by 2 new condo buildings with not a tree added at ground level. Thats the weird part. If you look at it on google earth there are actually trees a few floors up on the landing of The Victor. Also, that view highlights how much thinner Haverhill Street is compared to the ones on either side of it. It might be a case of either not having room for both trees and pedestrians, or not having enough overall sun for the trees to survive on that street. Note that besides Canal Street and a smattering on Beverly, none of the other parallel roads in that area have trees. Yea I know they have trees on the garage that makes it even more annoying haha. Boston has been outpacing other cities and even as other cities housing markets are maturing in this cycle Boston is predicted to carry on full steam ahead for the forseeable future. Now that the west end is getting less crappy, why the hell is there still a jail on the downtown waterfront with a massive parking lot? Move that crap... anywhere. Rikers island closing got me thinking why the hell is our jail on absolute prime real estate, close that ish asap. I mean, if there ever were a North Station expansion that would be where you'd put it. Edit: Whoops mixing it up with 125 Nashua St. I was wondering if someone could point me in the direction of some news or documents about all the new lamp posts going up around town. Its clear to me that they are some type of integrated wireless tower lamp posts, possibly related to 5G? I saw a bunch going up in Downtown Crossing in February, a few more around town going up in March and now I'm seeing them on Huntington Ave. 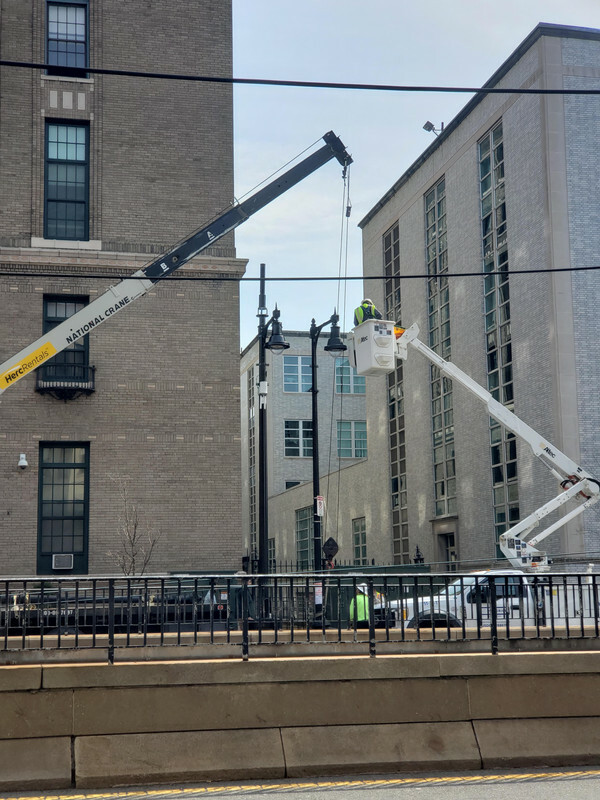 It would appear they are taking down old lightposts and replacing them with almost identical ones that include a tall pole on top and an electrical box at the bottom which implies micro cell tower to me. Any ideas?